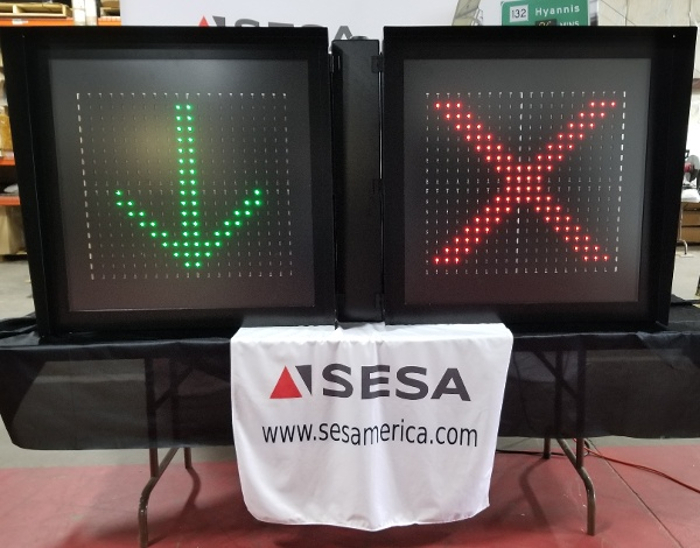 One of the USA’s leading manufacturers of digital, LED signage for the transportation industry, SES America Inc. (SESA), has released details of its latest completed projects in Wyoming and Virginia. 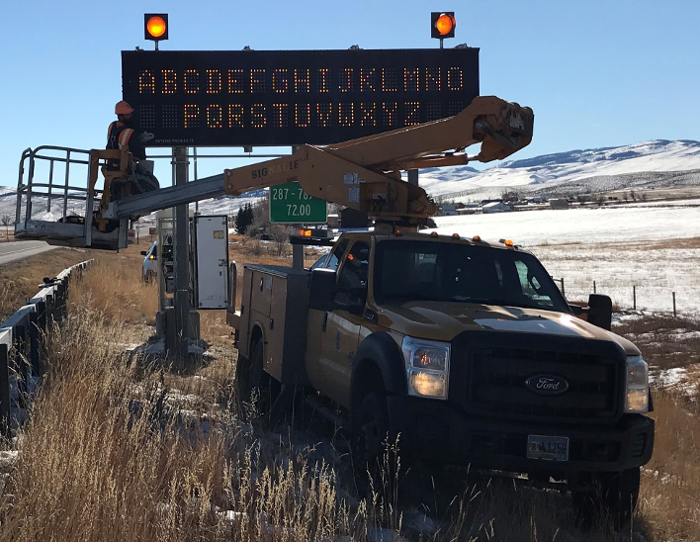 On behalf of the Wyoming Department of Transportation (WYDOT), SESA has successfully completed two new-technology retrofit upgrades of existing legacy Dynamic Message Signs (DMS) along each end of Highway 26 near Lander. The high-contrast, high-visibility DMS are the final part of a 43-sign retrofit LED installation project that has been completed over 14 months all across the state, including those on the primary freight transportation route along over 340 miles (547km) of Interstate 80. On a primary route to the Teton National Park, these SESA retrofitted LED signs are displaying brightness capabilities greater than 50% of the previous signs by illuminating messages with a crisper amber color, offering a stark contrast to the snowy conditions prevalent from December to March. The upgraded signs are capable of displaying two lines of 15 characters each and will post both weather and travel related messages on this rural two-lane roadside application. In addition to updating sign functionality using the existing housings, SESA has also aided WYDOT in the final commissioning of every sign. With select signs at over 8,200 feet (2,500m) elevation in constant sub-zero temperatures and with gale force winds for much of the winter, SESA’s web-based SCU6 DMS controller will enable WYDOT’s field ITS personnel to access each sign wirelessly, lessening their exposure to both the elements and hazardous driving conditions. 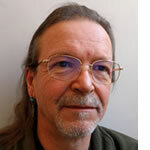 The upgrades have saved WYDOT more than US$1.2m in sign replacement costs alone, excluding the US$800,000 of installation costs for new units. SESA has also recently completed a successful installation of 24 lane control sign (LCS) systems on the Arlington Memorial Bridge in Virginia. The system, deployed as part of a collaborative effort with local company Traffic Systems & Technology, will be used for contraflow traffic management while construction work on the bridge is completed over the next few years. The two partners were able to provide an approved design and turnkey solution in under six months from concept to delivery. The system also features four temporary gantries with six LCS on each gantry, mounted back-to-back and located at each end of the bridge and at spaced intervals along its full length. During ongoing construction, the bridge, normally consisting of three open lanes in each direction, is reduced to only three lanes on one side while deck work is completed on the opposite half. The lane control system provides congestion management by opening the center lane to inbound traffic during the morning rush hour and then allowing outbound traffic to use the lane during heavy afternoon drive times. Conflicting signaling is prevented via SESA’s electrical design in combination with NTCIP software developed by Genetec exclusively for the project. Each sign features a bright LED display capable of displaying 18in (46cm) symbols to inform motorists of openings, closures and pending closures of the lane. 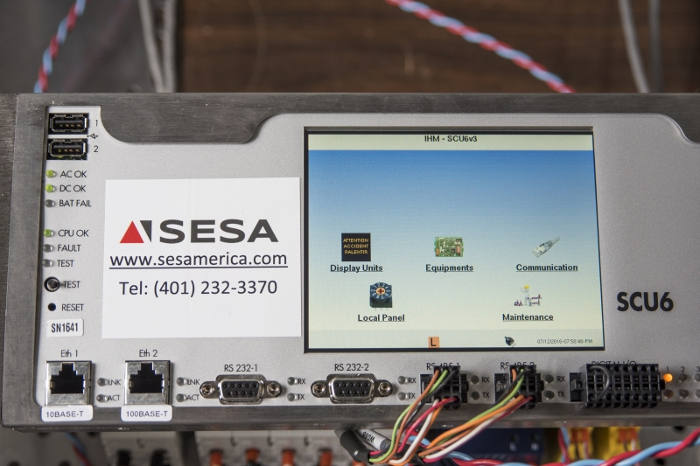 Sign control is accomplished via the SESA SCU6 touchscreen controller, with cellular connectivity to the control software via 4G LTE modem.